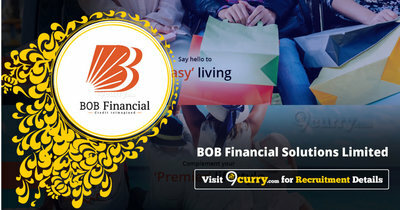 BOB Financial Solutions Limited Recruitment 2019 - Job notification for Officer II Post – Credit Underwriter – Credit Cards in BOB Financial Solutions Limited, Mumbai, Maharashtra. Applications are invited by BOB Financial Solutions Limited (BFSL - formerly BOBCARDS Limited) on or before 20 Feb 2019 for 1 vacancy. Graduate degree in any stream. Post Graduate degree will be an added advantage. 2-5 Years as on the last date of receipt of application. Eligible candidates may Email to careers@bobfinancial.com with the subject as “Officer II – Credit Underwriter – Credit Cards” on or before 20 Feb 2019.